The Binghamton Urban Farm is a small market garden located on the east side of Binghamton’s downtown, managed by Volunteers Improving Neighborhood Environments (VINES) a small not-for-profit in the City of Binghamton. Our goal at the urban farm has always been to create access to fresh affordable food where there once was none. I am happy to say that with each new season, the urban farm has been able to grow and distribute more food than the last. The main fruit and vegetable garden is about five thousand square feet and produces food for the Downtown Binghamton Farmers Market and Binghamton Farm Share, a food box subscription program. There is a high tunnel for seedlings and, when we have the energy, an extended season. This spring, we will plant a small ecological orchard with plums, pears, berries and lots of perennial herbs. Each season, we work with youth from the City of Binghamton to teach them gardening skills and educate them about the food system. Binghamton, like many other cities across the country, struggles to find a way to address the issue of food insecurity in some of its less well-off neighborhoods. There are different definitions of food insecurity. In Binghamton what seems to be the major issue is that too many people do not have easy enough access to the kinds of foods that support a healthy lifestyle. There are too many barriers both physical and economic to accessing healthy foods, and people resort to eating the processed foods available at gas stations and convenient stores. These foods are cheap and easily accessible. But these foods also play a major role in the rise of chronic diet related diseases and are produced in an unsustainable way. Growing more food directly in cities helps, but it is only one piece of the puzzle. Urban food insecurity is the result of the intersection of cultural, physical and economic factors. Thinking about these complexities reminds me of an interesting conversation I had with a friend when work first began to launch the Binghamton Urban Farm. I was describing our plan to him. We would find some vacant lots in the city, lease them, bring in soil and compost, grow food and make it available to the community. My friend’s response to this plan was very straightforward. “That sounds weird,” he said. “Why not find land outside the city where you can grow lots of food, where there is already soil and just bring the food into the city?” Initially, his response made the idea of an urban farm seem convoluted. Why convert city lots into sites of food production when there is plenty of room to grow food outside of our urban areas? My friend’s response was a reasonable one especially given that the four city parcels that have become the urban farm at the time were occupied by four burned out houses, piles of trash and overgrown weeds. However my friend’s response overlooked one of the main goals of urban agriculture: reconnecting urban people to the practice of growing food in hopes of one day changing the broader food culture. Changing the broader food culture starts and ends with changing our relationship to food; what we know about where it comes from, how it is grown, and the way we eat and obtain it. Urban agriculture is one point of leverage to begin fostering this broader change, while dealing with the very real issue of urban food insecurity. The way urban agriculture deals with both the broader cultural issue and the particular issue of food insecurity is by reclaiming urban spaces so that food can be grown directly in urban communities. It is also important to engage community members, as best as possible, in the practice of growing food. Making land and food available goes a long way to solving the accessibility problem. 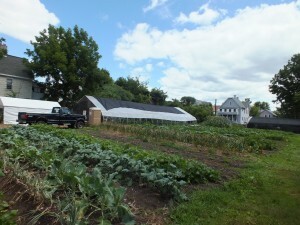 Food is grown in neighborhoods. It comes straight out of the ground and into the hands of people. This is as direct as access gets, and it reconnects people in urban communities to food and agriculture in such a way that will eventually lead to broader social change. We need to begin to look at our urban communities as not just a place where food gets consumed, but also as a place where food gets produced. In order to create these changes we need to overcome two major obstacles: urban soils need to be reclaimed from the harmful effects of urban development, and urban communities need to relearn and reinvent specific agricultural practices. There was a time (it seems that there had to be) when people were not in the position to have this kind of realization, not even young people. That food came from soil was common knowledge. It was knowledge ingrained in us since childhood. It was cultural knowledge. That so many of us now, especially in urban areas, are in the position to have this realization when we are first exposed to agriculture is telling of our culture’s relationship to food. There is a disconnect between the most basic resource that sustains us all and the way we tend to think about urban development. The disconnect is a physical one. There just is not much soil left uncovered or undisturbed in urban areas. If there is a bit of topsoil, it tends to be shallow, infertile or utilized as an ornamental lawn. This makes growing food in urban areas very challenging, but not impossible. For those members of urban communities that have been marginalized by the industrial food system having a soil resource in their neighborhood could make all the difference. There is, however, also a knowledge disconnect. It is not enough to simply make gardening space available. People also have to relearn how to utilize such spaces in productive and healthful ways. Education about the food system, including but not limited to how to grow food, is perhaps the most important role urban agriculture plays in bringing about a more fair and just food system. The hope is that as the relationship between soil, food and health becomes clearer, community members will demand sovereignty over their food choices, and demand the kind of food system that can legitimately offer people such sovereignty. The most pressing challenge of urban food insecurity is finding a way to make healthy fresh foods affordable and available in an immediate way. 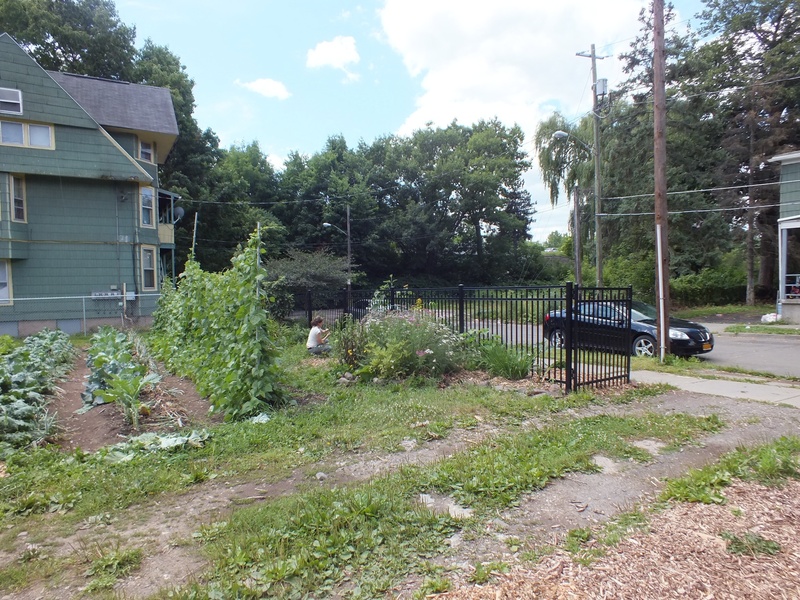 Projects like the Binghamton Urban Farm seek to do this by growing food directly in urban neighborhoods. Although this is the most immediate challenge, in the sense that it affects people’s lives on a daily basis, the ultimate challenge is to pursue a food system model that is built on participation and collective ownership rather than disconnection and consumerism. But to move in this direction we have to be more wiling to put our hands in the soil and reconnect with our food. We have to live where food is grown. Sean Cummings is the Binghamton Urban Farm Manager. For more information on VINES, he can be reached at (607) 232-3582, or visit vinesgardens.org.